Synopsis: (from IMDb) Paranormal investigators Ed and Lorraine Warren work to help a family terrorized by a dark presence in their farmhouse. 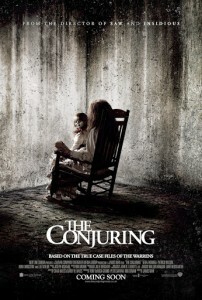 My Quick Review: I have to admit I wasn’t as impressed by The Conjuring as most of my fellow reviewers/critics. Is it an efficient horror movie that provides a few scares and thrills? Most certainly so. Is there anything original about the proceedings? Unfortunately not. Of course I did enjoy the 70’s settings and how James Wan is paying homage to some of the biggest classics from this period (The Exorcist and The Amityville Horror come to mind of course). He is crafty enough to give it a modernized style inspired by Asian Horror Cinema. Therefore, the movie relies on tense build-ups, rare ghost/demon sightings and convincing performances to provide the goods, and you will find yourself looking for things in the dark more than once. But this is where the main problem lies. By not wanting to show us much, the scares are few and far between. James Wan is improving as a movie director with each of his movie and the Conjuring is probably his best-made film so far. Unfortunately it’s not the scariest (Insidious was) or the most horrific (Saw). It’s an extremely decent hollywood horror movie but for horror fans there is something lacking. This is a real horror movie. Theres no bs involved in this thrilling and chilling film. It has been a long time since I have watched a movie as creepy and entertaining as this one especially since it has to do with demonic and paranormal activities. Which have been close to dying since so many of these movies have been made in the past few years. This movie is a must watch. And i would rate it 4 out of 5 stars.